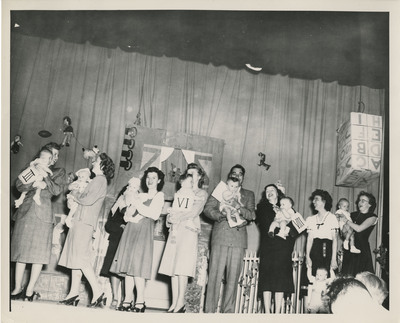 A group of women hold babies on stage at the G.I Wives Baby Show with Associated Students of Linfield College (ASLC) President Jack Frost. Unknown, "G.I. Wives Annual Baby Show 01" (1948). Linfield College Archives Photograph Collection. Image. Submission 122.